Marc Bitzer, the box-owner of CrossFit Albstadt, is giving us a little insight into what happens at his BOX in Germany. I saw the movie “Every second counts” about the 2008 CrossFit Games and was fascinated of what this guys did. After that I started to do some of the main page WODs and was completely destroyed after each one, but I had a total blast every time! After a few months I was completely addicted. I had enough of our local gyms. I wanted a place without guys who write SMS while they were training, and people who read newspaper on a “Crosstrainer”. I wanted a place for my friends an me were we could train an hang out. So I decided to take the Lv. 1 and searched for a place to open a box. A few months later we started. Best decision ever! We are a big family, everybody knows and likes each other, every new athlete gets a warm welcome and gets help from everyone. It´s the type off community every CrossFitter likes. Our Coaches are very enthusiastic about what they do. We take us a lot of time for everyone and we try give our Athletes a great training experience every time they come in. How does your member structure look like? We are a small box with about 30 Members, but we have all types of athletes. The youngest Member is 17 and the oldest about 50 years old. We have athletes who train nearly everyday and work hard on their skills for the open and we also have athletes who just like to CrossFit and train only 2 or 3 times a week, to stay fit an healthy. Do you have additional training possibilities (Yoga, Gymnastics etc.) ? We do special Gymnastic Classes, Taping Classes, Yoga Events but not regularly. Mainly we do CrossFit. We don´t do special consulting for nutrition, but we help our members if they have any questions. We give our members all the important information about nutrition and let them decide for their selves what is best for them. For me there is not only one right way. Everyone needs to find out what is best for him. We just help them to find it out. Our Beginners learn the foundational movements in a one day fundamentals class. Main Objectives are to let them feel the right positions, show them how our coaching looks like and what the cues are. 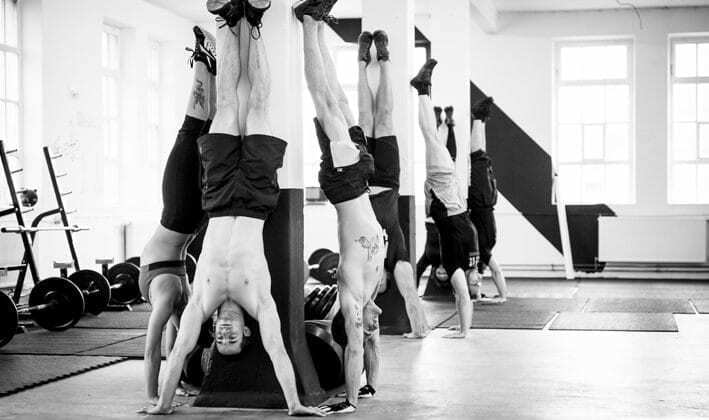 After that they jump into their first WODs and do scaled versions of them. The first Month is a trial month so they can see if they like our box. In our first year we focused in getting good fundamentals and did more training and not so much competition. But we are planing some special events for our members for the next year. What’s your take on Fitness? CrossFit has chanced my view on this. Now Fitness is for me, being able to do everything I want to, playing beach volleyball in the summer, swimming, biking running, climbing, slacklining, lifting… It´s all about having a good feeling about how me body works and what he is able to do.